Bleeding gums are usually accompanied by some level of swelling, since the two go hand in hand. If you aren’t cleaning properly or have active gum disease or a build up of plaque or calculus then the body responds by opening up blood vessels to send more blood to the area to help protect it. As the blood vessels open up they increase in size and the gums thus appear swollen. Remove the cause by a dental cleaning and the gums will return to normal- the redness, swelling and bleeding will stop. Inadequately removed plaque from the gum line will over time harden forming calculus (the build up most people get a build-up behind their front bottom teeth). This attracts more plaque and the process continues. 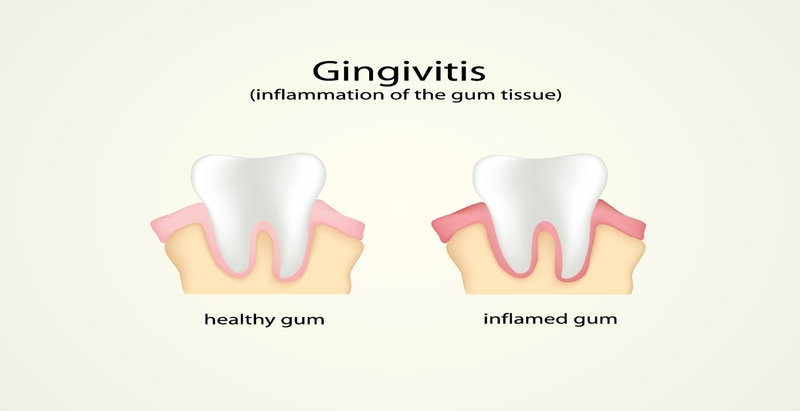 Inflammation of the gums is called gingivitis and is reversible. It can however lead to more serious gum disease. – Medications than increase the tendency to bleed (Anticoagulants e.g. warfarin, Antiplatelet drugs, e.g. aspirin and clopidogrel. Certain epilepsy, convulsion and seizure medications, Chemotherapy drugs, Immunosuppressant drugs and certain heart medications). – Stopping smoking- Smoking actually suppresses bleeding gums since the nicotine causes blood vessels in the gums to constrict. It masks a surprising amount of damage and is a serious risk factor in gum disease and oral cancer. If you stop smoking your gums can bleed significantly especially if your hygiene isn’t great and you haven’t been seeing a dentist. It is just your body’s response returning to normal. It can take a couple of weeks to calm down but please persevere. Abscesses- a localised swelling of pus. Left untreated, significant irreversible damage may occur which can lead to pain, your teeth moving and eventually the need to have them extracted. This is the progression of gum disease; it’s much easier to treat in its early stages and the prognosis is greatly improved by excellent hygiene and regular care and deep cleaning by Dr Jamie once it is identified you are susceptible. How do you treat bleeding gums? As always Dr Jamie will tell you getting the correct diagnosis is the first crucial stage. This will involve an examination where he will get chance to ask you a number of relevant questions, including your medications, smoking, diet, other symptoms and about your oral hygiene practices. It will involve examining your teeth and gums and x-rays are also likely to be required for assessment of gum disease. The treatment for gum disease is more involved if identified from the x-ray, and he will guide you through all the questions you may have at the appropriate time. The treatment required largely comes down to the stage of the disease and in certain circumstances this may require referral to a specialist periodontist. Gingivitis however is fairly simple to treat and involves professional teeth cleaning in order to remove plaque, calculus build up and dental prophylaxis. After the treatment, Dr Jamie will guide you through your home care regime, to ensure you keep everything nice and clean – so your gums have a chance to heal. If gums continue to bleed without the presence of gingivitis – which will take a week to settle down – Dr Jamie may need to refer you for a full blood count to see if you have any deficiencies which are contributing to the problem. How can I prevent bleeding gums? First you need the harder calculus and tartar removed; as there is no way this is coming off with a toothbrush and flossing alone. Dr Jamie will give you instructions on how to properly take care of your gums and teeth at home- the correct technique for brushing, flossing and using the little interpoximal brushes if they fit. He will also recommend brushing the back of your tongue which harbours a lot of bacteria implicated in gum disease. If the cause of bleeding is a result of other factors above, then these will also need addressing. Once under control you simply need to return every 6 months for your regular check up and clean.